Imagine walking down a snowy winter street. It’s not so bad, is it? It’s even a pretty scene in a way, all that bright snow shining on the ground around you. But then, tragedy strikes. You slip, you fall, you’re in pain, you’re lying on the ground, humiliated, no-one helps, they just laugh at you. Awful. There’s no coming back from that. 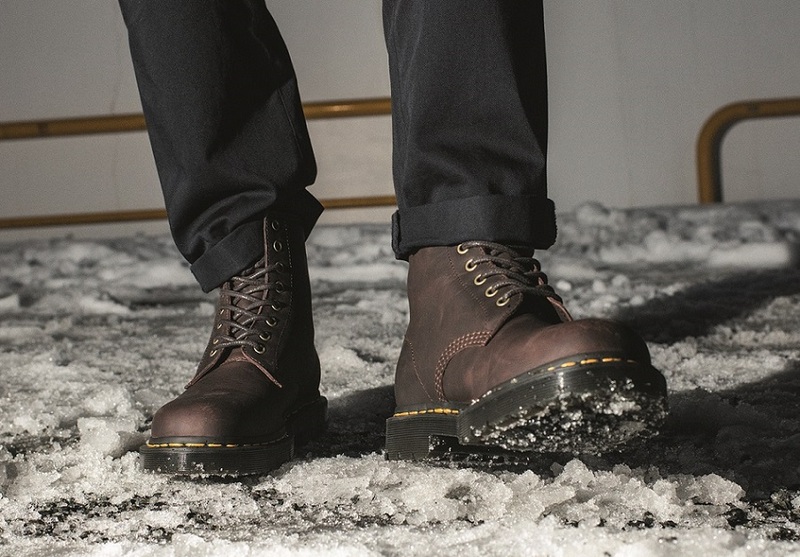 Anyway, you get the idea, and so do Dr. Martens, because they’ve launched a new version of several of their models for the winter season. The Dr. Martens models 1460, 2976, 8053 and the Chelsea Boot come with new soles for a range they’re calling Wintergrip. As well as a new sole for greater grip, the upper part of the shoe is encased in special Snowplough quality leather designed to handle the ice, snow and salt of the winter season. The shoes’ interiors also include fleece and fake-fur for extra warmth. The new range will be available online and in Dr. Martens shops from October.